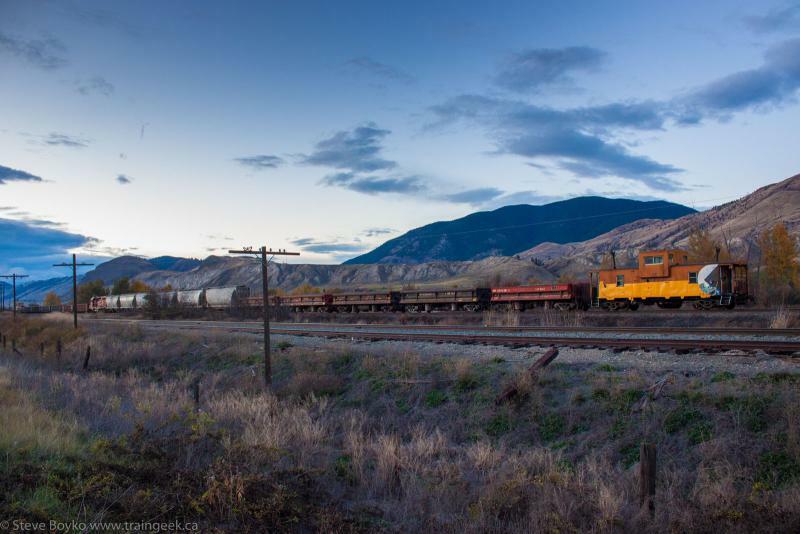 I was in Kamloops, British Columbia this week for work, so of course I did a little railfanning for a few evenings. Of course, it's October so the daylight hours are less, but you do what you can. 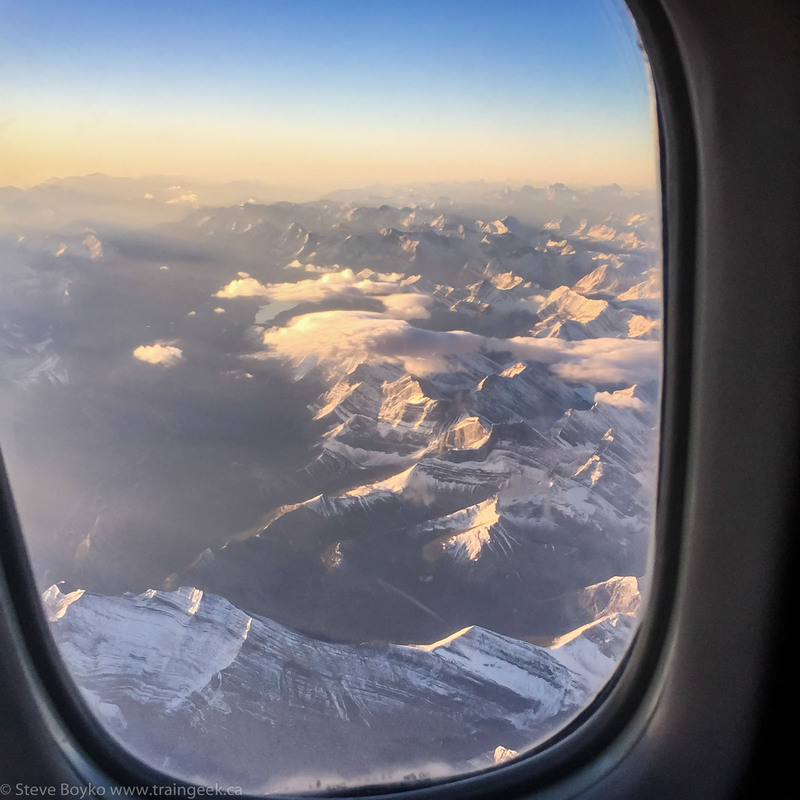 I landed on Monday morning, after cruising over the lovely Rocky Mountains. I am loving my iPhone 6's camera... so much better than the old Blackberry Torch. On Monday evening I went down to CP's yard in Kamloops. There was not much going on but I did spot a snow plow and spreader. You might remember that photo from a recent post where I was showing the before and after of this photo shot toward the sun. There was a train waiting with CP 8609 on one end. 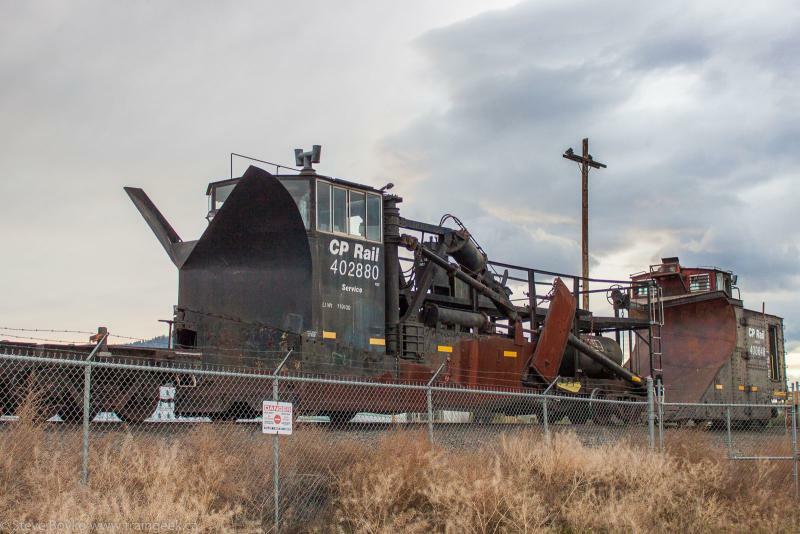 CP 3011 was working the yard in the background. I waited for about 20 minutes as the light continued to fail, but it didn't move. I thought this was the head end but there didn't appear to be any crew in it. I decided to go see the Rocky Mountaineer shop (from afar) while there was still a tiny bit of light. 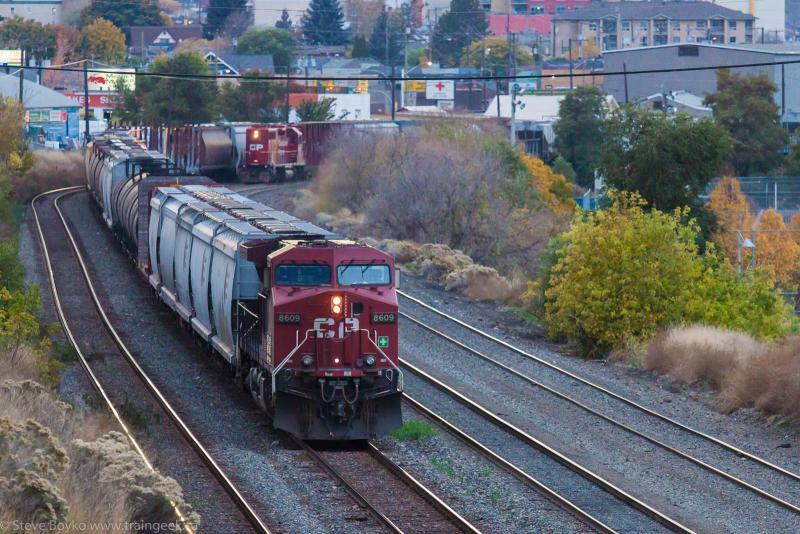 I saw several RMRX locos as well as a couple of NREX leasers. That was it for Monday night. 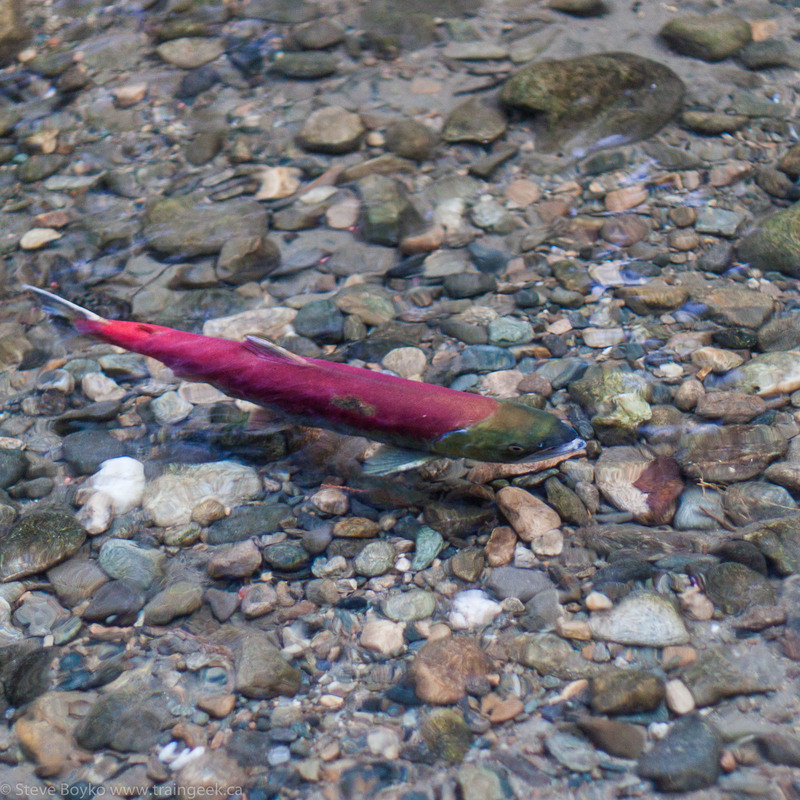 On Tuesday evening my client took me out to the annual Adams River Salmon Run, which was pretty incredible. 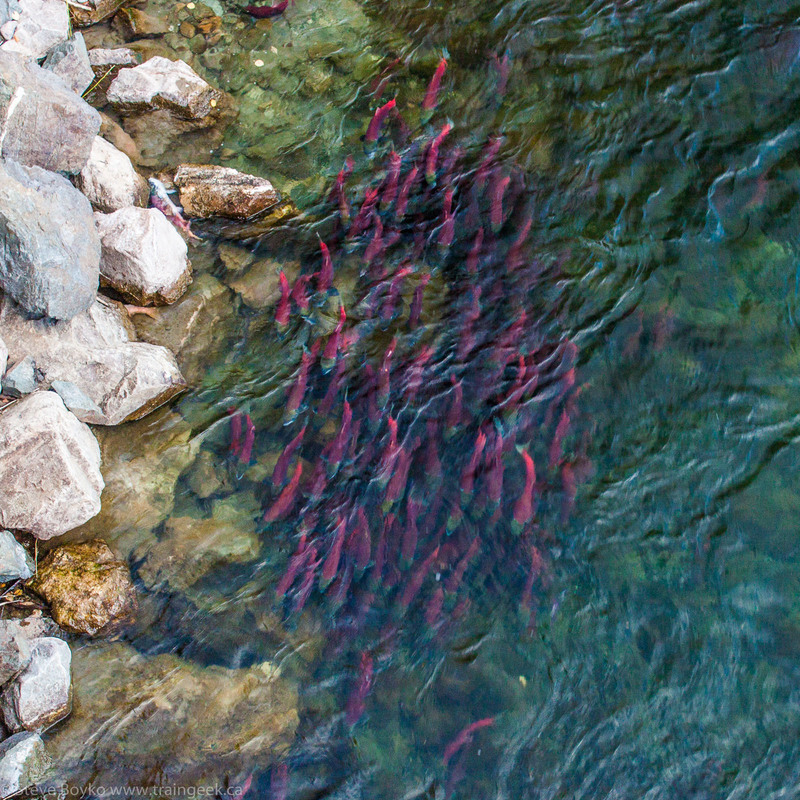 It's hard to imagine that a million or more salmon make the two year trip from the Pacific Ocean all the way to here to spawn. There were so many fish! Here's a few photos, totally not train-related, but I want to share a glimpse of the event. Pretty clear, eh? 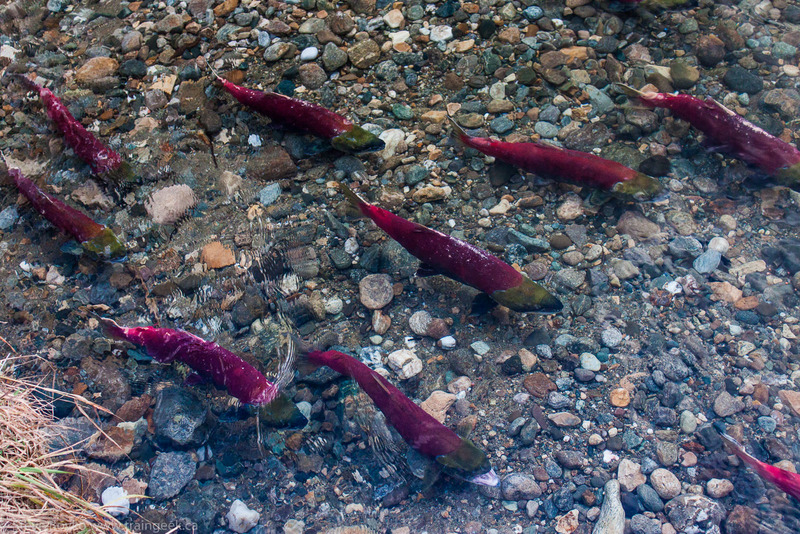 I used my circular polarizer to cut through the surface glare to reveal the fish underneath. It makes a dramatic difference, especially near sunset like these were. 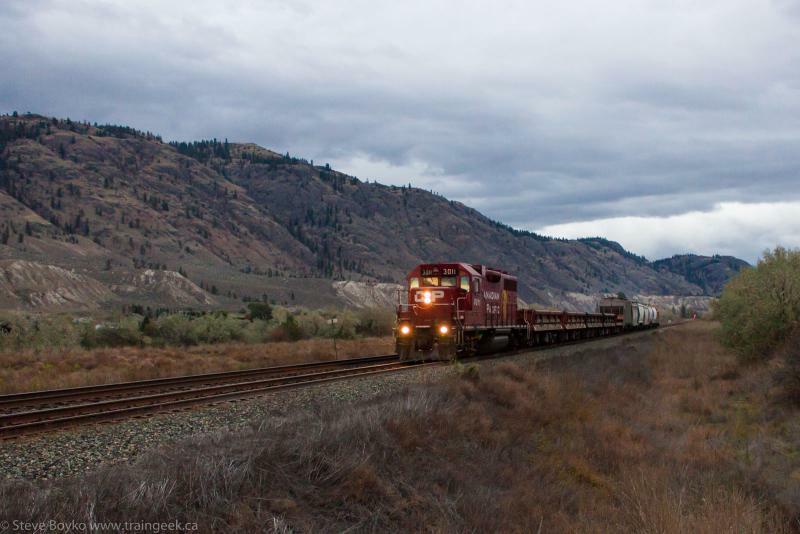 Anyway, on the way there, I spotted a CP coal train heading toward Kamloops and took this photo from the passenger seat of the moving car. Everything was great.. except for the pole line. 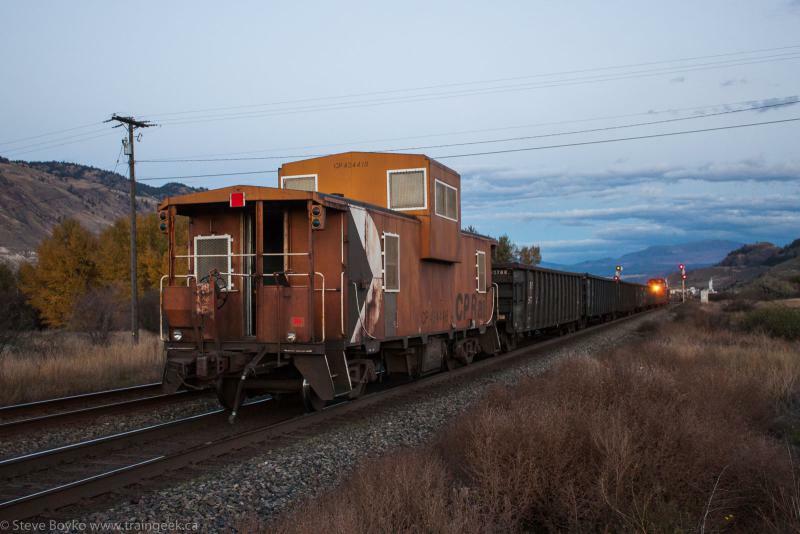 On the return trip, we stumbled across a very odd work train. 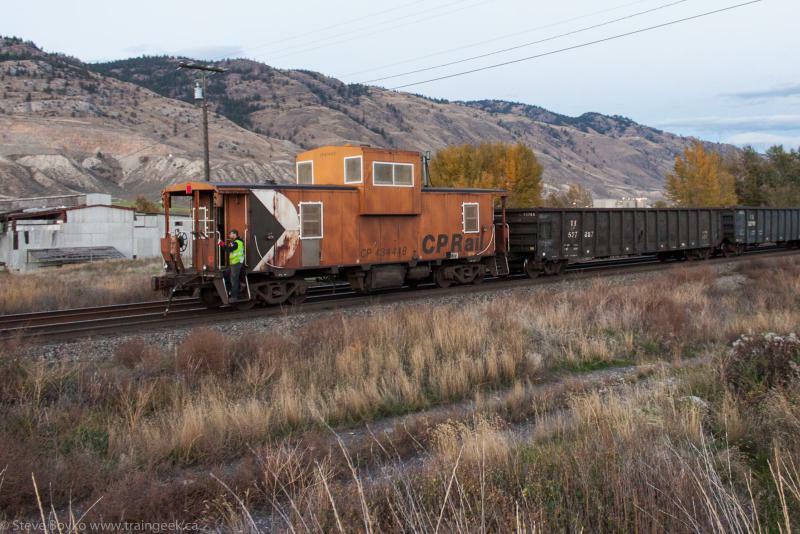 It had CP 3011 in the middle, surrounded by cars and a caboose on each end. I've never seen a configuration like this. The caboose in the foreground had no number on it. The crew dropped the foreground portion of the train (hoppers, ballast cars, and unnumbered caboose) into the siding, then backed the other caboose into another siding a bit farther west. Here the conductor is riding the point of the movement. The conductor dismounted and lined a switch for the siding, and CP 3011 pushed the short train into the siding. 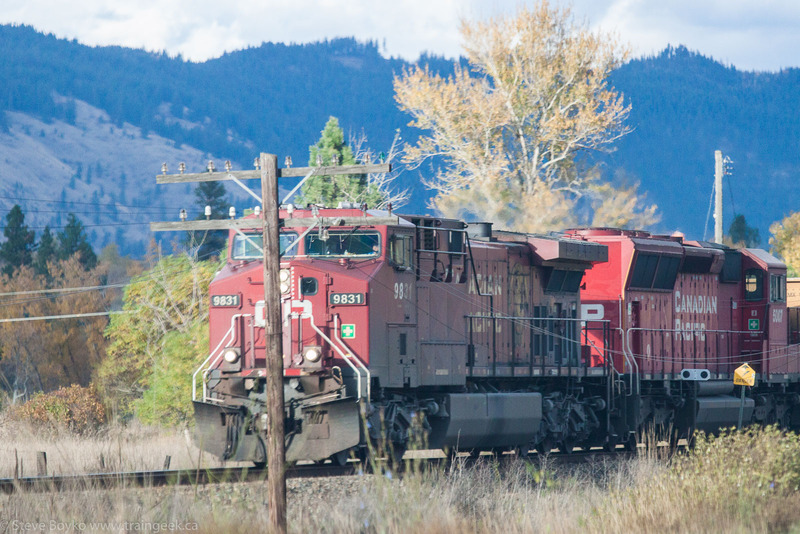 On Wednesday evening, I decided to head back to the CP Shuswap subdivision to try my luck again. I found a quiet crossing just off the highway east of Campbell Creek and parked near there. There was a car sitting there when I arrived, but after a while it drove off. About fifteen minutes later, a CP hi-railer truck came from the road side, used the crossing, turned around, and crossed back again. The passenger gave me the wave as they went by. I was thinking about why they were there and I figured someone called in that someone suspicious was loitering by the tracks. I guess I was considered harmless. Eventually I spotted a headlight to the east. It turned out to be CP 3011 from the previous day, with a similar consist to the one that they had dropped off the previous day. It was not quite the same, but close. They were motoring at a very good speed. I tried chasing them toward Kamloops but I think they stopped in Campbell Creek. 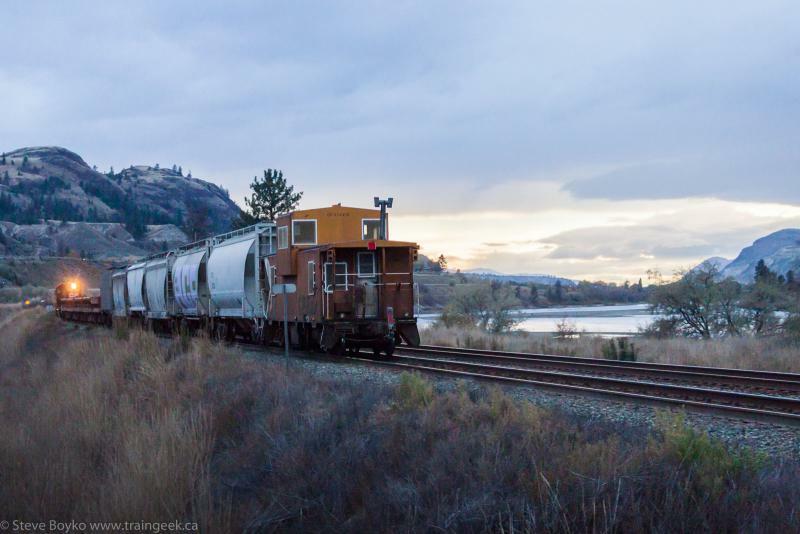 However, I did catch this grain train heading into Kamloops. 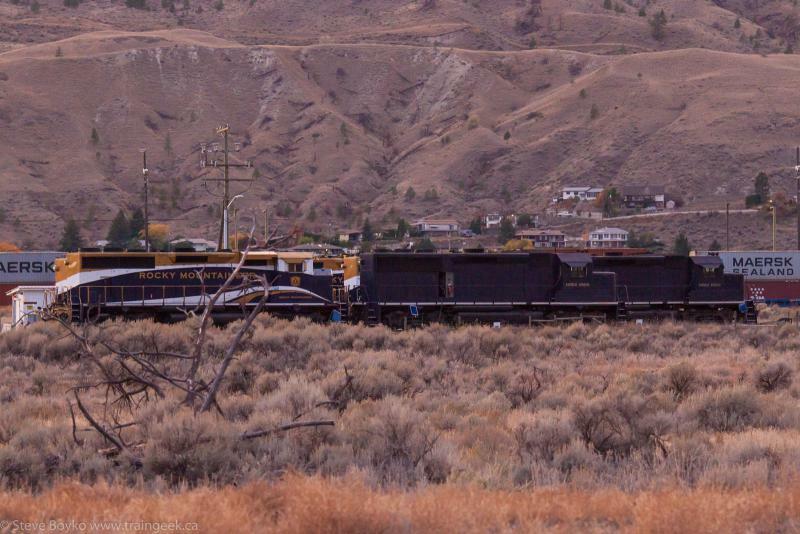 I saw a coal train parked just outside Kamloops, with these two engines on the head end. CP 8728 is an ES44AC, a pretty common engine on CP. CP 5005 is an SD30C-ECO, a rebuild of an SD40-2 with a new engine, new cab, new alternator and new electronics. CP 5005 used to be CP 6039. 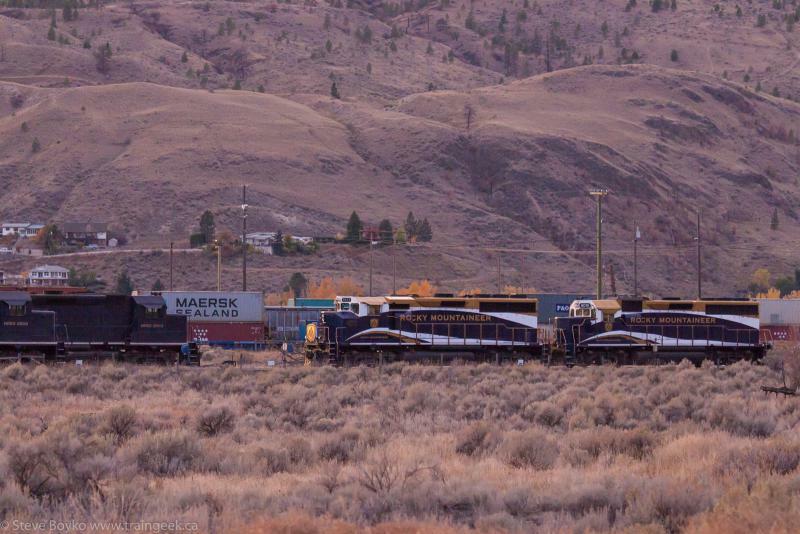 That was the end of my railfanning in Kamloops. On Thursday night we attended the Sarah McLachlan concert. It was awesome!